Following the Olympic success of British athletes, Judy Grahame - employer M&C Saatchi PLC, turnover £169.37 million and profits £17.2 million - and Richard Morrison - employer Rupert Murdoch's News Corp, turnover £1.64 billion, profits £146 million - and others among classical music's great and good want to talk about public funding. Yes, by all means let's do that; but we must not forget that talking about funding means more than just talking about increased funding for classical music. Because if you simply increase funding without making other changes, the rich get richer, and the poor get poorer. So let's talk about another aspect of pubic funding - transparency. Lack of public funding is not the only problem. Inequality of funding within classical music is also a serious but less newsworthy problem. As has been pointed out here before, the annual income of £26,000 to £37,000 for a rank and file London musician is in the public domain. However the salary of their conductor is not, but single concert fees for a Rolex maestro in London are estimated at £20,000. And that inequality between celebrity and rank and file musicians is not the only problem: because around a further 15% (£3000 per concert) goes to the maestro's management agent with an additional payment often being made to the tour management for touring orchestras. London based high profile ensembles receive a significant portion of available public funding for classical music. Because of an institutionalied lack of transparency, accurate information on how that funding is disbursed within ensembles is not available. But an informed estimate suggests that up to 30% of the total publicly funded subsidy for a London concert goes to just three parties, the conductor, his agent and the tour management, with the remaining 70% being divided between up to 100 less fortunate participants. As I said in my previous post, classical music must make the case for increased funding. But before doing so it must put its own house in order. For orchestras and other institutions in the UK receiving public funding, musician and agents fees for a single appearance of more than £2500 should be declared, as should annual retainers of more than £75,000. Furthermore public funders should make it a condition that all fees above £2500 for a single appearance and above £75,000 annually should be funded 50/50 by public and private sources. But nothing will change. Because the knee-jerk retweets of pleas for post-Olympic increases in classical music funding come from those who benefit most from the current unequal distribution. So I am not holding my breath waiting for my proposal to be shared on social media by classical music's great and good. But this is another subject. 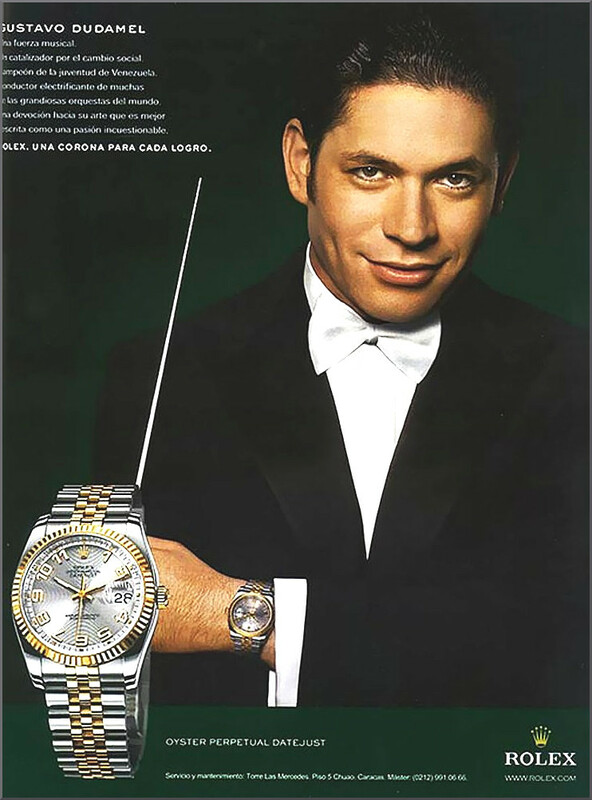 If a Dudamel makes money by doing Rolex ads, that is life. Good for him. For all what we can feel about the status of the country of Venezuela and discuss the exact status of El Systema, Dudamel spends time working with younger generation while and he could be 100% touring with the big orchestras and the TV studios. Some great classical music stars do not do this. Also, having these musicians on TVs and ads ultimately is publicity which helps classical music and by consequence less public classical musicians. So I am not concerned about these harmless ads and the differences in fees. These are more market factors like in any other businesses.